Advance Transport Systems (ATS) has a radical idea. They call it ULTra (short for Urban Light Transport), and at first blush it seems as though it’s a great new idea for the age-old problem of moving thousands of people around in a modern city on a day to day basis without cluttering up the streets with smog-producing cars and busses. Sure, you could hop on the subway or take a bus if that’s available in your neck of the woods. The only problem is public transportation tends to be crowded or inefficient, which means you have to leave earlier than you would with a car and get to your destination usually after a walk. If you’re trying to conduct business, this is far from ideal. That’s one of the things that makes ULTra such a good idea. 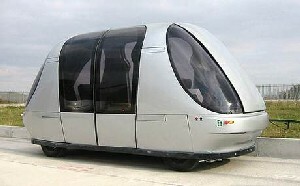 It’s private public transportation (kind of like jumbo shrimp). It takes you wherever you might want to go on a rail system. No driver required, and while you’re on your way, you can do your work in peace and solitude. The wait times are supposedly minimal based on simulations, and because the units are powered by self-contained batteries, building the rail and station system is cost-effective. My one qualm, and it is a minor one, is… how is this better for the environment than a car? Sure, the ULTra isn’t congesting roads and spewing out smoke, but it is still using a lot of resources for transporting one individual around. You can still travel from only point to point, so to speak, but it is cheaper than renting a car or hailing a cab to get from the airport to the hotel, so there’s a personal monetary benefit. Something still has to generate this power, and there’s still the risk of congestion on the tramway if everyone is trying to get to the same hotel or convention center. I’m sure ATS has answers to these issues, and studies on environmental impact and so on. 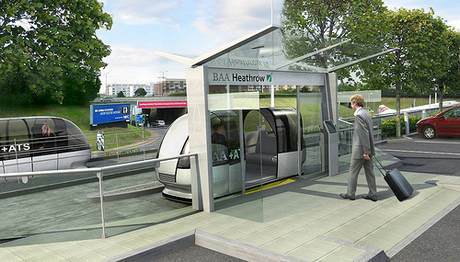 Starting in the fall of 2008, you’ll able to hop on the ULTra at London’s Heathrow airport and go zooming off. I know I’d love to give it a try, just for the experience!